One of the most characteristic abilities of humans is the ability to produce and understand complex language that is primarily abstract and metaphorical in nature. This stands in stark contrast to the gestures and innate calls of other animals which are reactive in nature, that is to say animals can only communicate about items in their immediate environment while human speech doesn’t rely on environmental triggers. [1, 2] Since the early development of language didn’t leave a distinct archaeological record which can be examined, in order to study its development we must examine physical evidence such as the tools left behind by early man as well as neurological studies, many of which compare the brain of man to that of closely related primates. Returning to matters of syntax, rules, and concatenated [chained] activity mentioned above, almost any model which describes a language process can also be used to describe tool-making. This is hardly surprising. Both activities are concatenated, both have rigid rules about the serialization of unit activities (the grammar, syntax), both are hierarchical systems of activity (as is any motor activity), and both produce arbitrary configurations which thence become part of the environment, either temporarily or permanently. 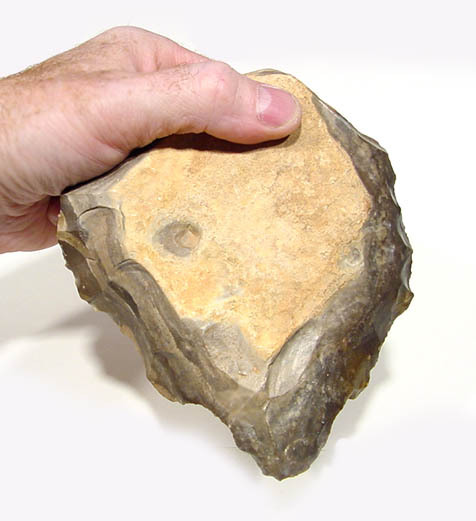 An important component of culture is the feedback cycle created by the tools, or arbitrarily structured environment, as the “altered environment shapes (man’s) perceptions, and these are again forced back upon the environment, are incorporated into the environment, and press for further adaptation.” So early man shapes a rock into a tool and in the process of doing so he shapes his own brain (neural networks, etc) and then once the tool is used it changes how man interacts with the environment which then gives feedback as to its efficiency. 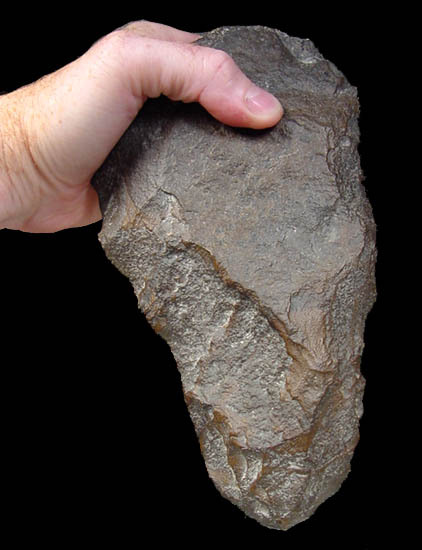 Making an Acheulean handaxe requires both working memory and planning memory. This careful planning is dominant in the initial phase of each experimental block in our study. This action planning draws on brain areas that are shared with language tasks, such as the left-lateralized ventral premotor areas and Broca’s area. Our subject pool shows highly correlated individual brain blood flow lateralization in the early phases of task execution for both tasks. Our findings add empirical data to the hypothesis that action planning for tool-making and language draw on shared functional brain structures. The correlated time-signatures for Acheulean knapping and language, which remain significantly correlated within subjects despite variability between subjects, indicates that the same brain networks are being activated for both tasks. They suggest that tool-making and language share a basis in more general human capacities for complex, goal-directed action. Another interesting study used a different type of neuroimaging, PET, which produces real-time three-dimensional images of the brain to map out the areas which are being used by an activity, in this case it was either Oldowan or Acheulean toolmaking by expert subjects. 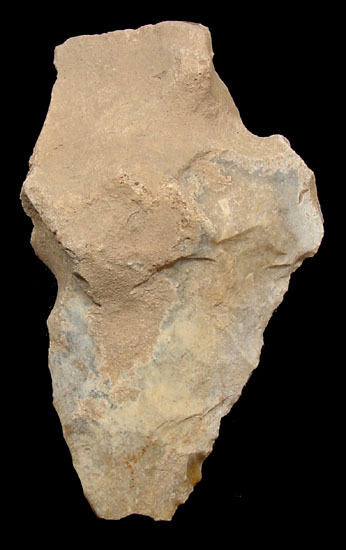 The subjects were all “professional archaeologists with more than 10 years stone toolmaking experience and already familiar with Oldowan and Late Acheulean technologies,” their tasks (which were divided over three days) were to create Oldowan-style tools, Acheulean handaxes, and a control task in which they were instructed to strike cobbles together without using any specific toolmaking techniques. Upon reviewing the results, the researchers noted that, “As expected, expertise was associated with increased IPL [Inferior Parietal Lobule] activation during Oldowan toolmaking. 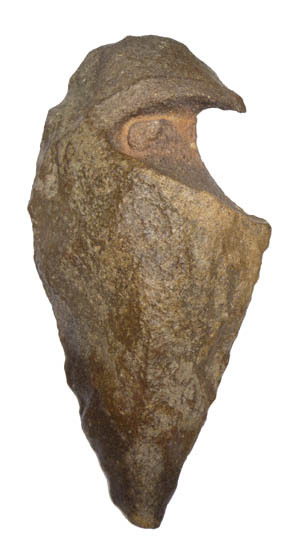 However, contrary to expectation, this activation was strongly bilateral.” They went on to say that it appears that improved handaxe creation is a result of more accurate neural representations of the body-tool combination, and not a consequence of enhanced motor planning/strategy as they had expected. 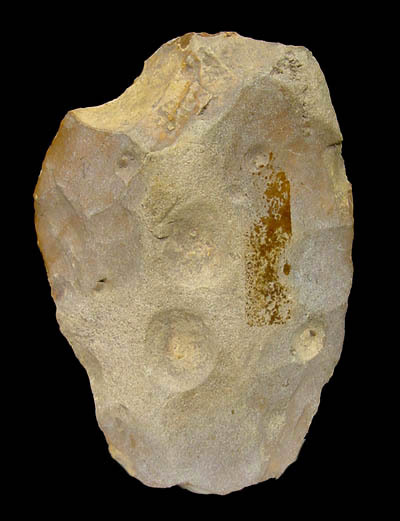 The enhanced sensorimotor representations of the tool-body system could perhaps have been developed through the millennia as hominins worked with stone tools, leading to what is essentially a more accurate neural analog of the body. 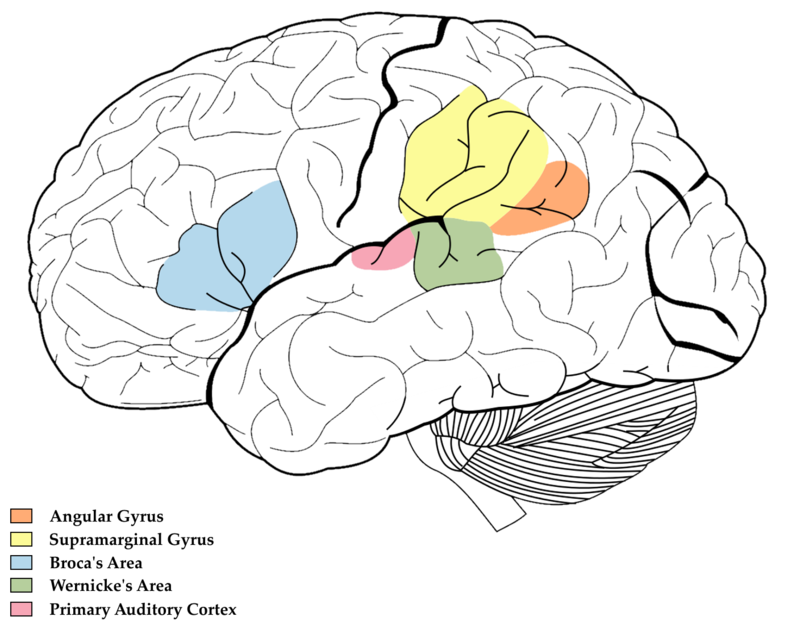 The primary area of the brain related to tool usage is the Inferior Parietal Lobule, the left IPL is located at the meeting place of the auditory, visual, and somatosensory (touch, temperature, pain, and limb position) cortexes and it is deeply connected with all of these structures. Because of these connections, the IPL is one of the primary areas for processing auditory and visual information and it is particularly important to language comprehension and mathematics– as well as memory retrieval, attention, and theory of mind. The right IPL, on the other hand, “organizes many spatial functions for both sides of the body and for both sides of external space.” The IPL is divided into two parts, the Supramarginal Gyrus and the Angular Gyrus, the AG is associated with complex language functions like reading, writing, and interpreting the meaning of writing; pioneering neurologist Norman Geschwind hypothesized that this area was responsible for translating written word to internal monologue. The right AG is responsible for spatiovisual attention as well as maintaining an awareness of the self through monitoring intended actions and the resulting actual movement, the discrepancy between these two allows the AG to maintain an awareness of the self. While not as involved as the AG, the Supramarginal Gyrus, or SMG, assists in language perception and processing, as well as being a part of the previously mentioned somatosensory cortex of which the SMG is particularly important in the perception of space and the location of limbs. The SMG is also a part of the mirror neuron system which is made up of neurons which are activated when an animal performs a specific action or observes another performing the same action. A recent study conducted using fMRI found that both humans and monkeys have activity in corresponding regions of the brain when observing hand actions and actions performed using simple tools, but in the humans there was additional activity in an area at the front of the left SMG (the left aSMG) while viewing actions performed using tools. The authors of the study stated that the activity in the left aSMG was only present when observing “goal-directed action performed with a mechanical device, vanishing when the goal of the action was omitted from the videos,” this led them to believe that the area had evolved specifically for tool use. The primary functional distinction between the human hemispheres thus involves the differential representation of linguistic and spatial mechanisms: These mechanisms, moreover, are selectively represented in restricted zones within each half-brain. It is of particular interest to note that while the IPL in the left hemisphere is involved in linguistic processing (see above), the right IPL is involved in spatial processing. Thus, the two functions that comprise the primary functional axis of brain asymmetry are dependent, in part, upon the integrity of homologous areas in opposite hemispheres. This complementary organization of IPL in the two hemispheres is, I believe, an important clue to the origin of human brain asymmetry. The story begins to unfold when we consider several factors discussed earlier: Spatial mechanisms are represented in both the left and right IPL in nonhuman primates and these mechanisms are similar in many respects to the spatial functions of the human right IPL. Given that the nonhuman primate IPL and the IPL in man’s minor hemisphere are homologous brain structures related through common ancestry (see LeDoux, 1982, for discussion) an important insight emerges: In man, language is represented in a region (IPL) of the major [dominant] hemisphere which, in the minor hemisphere, is involved in spatial functions, and was involved in spatial functions in both hemispheres of man’s ancestors. [For background info on the terms major and minor hemisphere see Note 1] The unavoidable conclusion of this line of reasoning is that the evolution of language involved adaptations in the neural substrate of spatial behavior. This quote has particular importance to a theory of the origin of human consciousness called the Bicameral Theory of Mind, the creator of this theory, Princeton Psychologist Julian Jaynes theorized that thousands of years ago the human mind was divided into two chambers. [If you’re not familiar with the Bicameral Theory of Mind please read the short summary here: http://manicmatter.com/origin-consciousness-bicameral-mind/). ] One of these chambers was used for basic functions which the individual had either been taught by their culture (like hunting, making shelters, etc) or learned and repeated many times while the other area was only used in the rare circumstance that a person encountered a completely novel, dangerous situation. This type of person was said to be bicameral, they lacked the ability to introspect or reason with logic so when they encountered a situation like a bear suddenly emerging from a cave nearby the other chamber of their mind would use past experience and tell the man side of the mind what to do– this was experienced as an auditory hallucination, and if this seems hard to believe then one needs only to look at the number of people today who experience hallucinations when under severe stress or isolation. 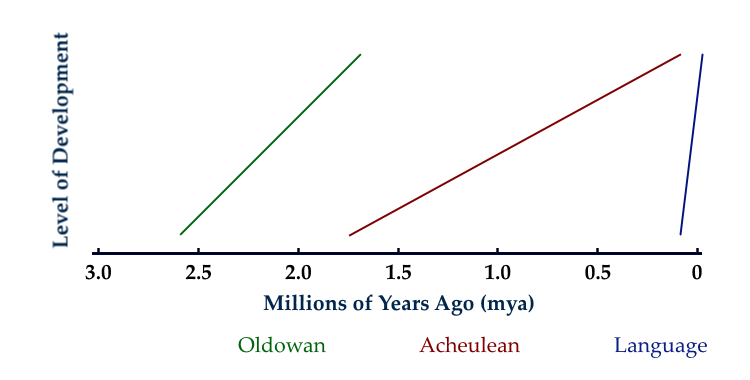 When reviewing the studies which were cited previously with this theory in mind an interesting picture begins to develop, but before surveying this we should turn to a paper which was referenced by the PET study of Oldowan and Acheulean toolmaking. 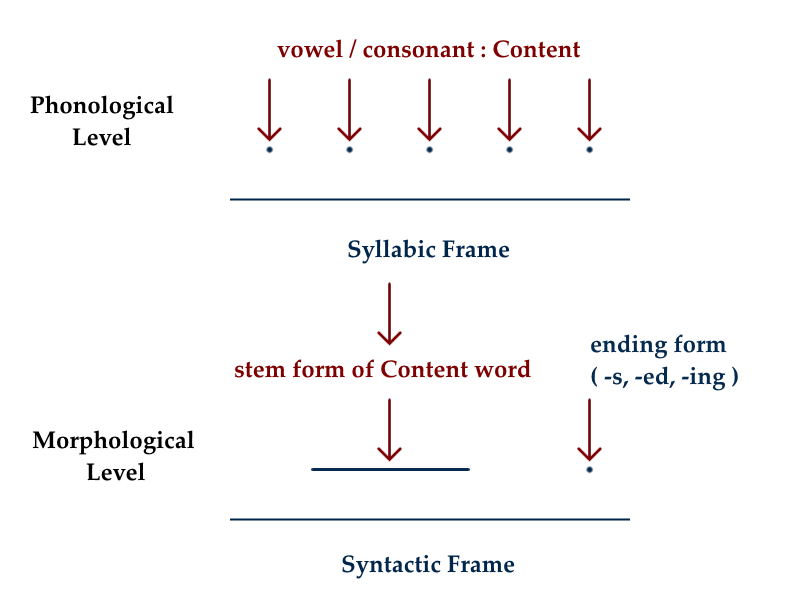 In a paper titled Functional Precursors to Language and its Lateralization the authors describe how language has a “frame-content mode of organization: at the phonological level, consonant and vowel elements are inserted into syllabic frames; and at the morphological level, stem forms of content words are inserted into syntactic frames.”[22, See image below] The authors of the paper then go on to propose that lateralization of brain function developed first for bimanual coordination, as is seen with stone toolmaking, before being used for language. Returning to the task at hand, the previously mentioned PET study stated that the function of the non-dominant hand is “not simply to execute gestures more typically done with the dominant hand but rather to properly position and support the core to receive the action of the dominant hand.” In other words, the content, or dominant hand, acts upon aspects of the environment which are framed, or held carefully in place, by the non-dominant hand; in this context, what is described here is what could be referred to as the Frame-Content Phenomenon where the dominant hand, which is usually the right one, would act upon the environment in a very direct way while the non-dominant hand would react to the actions of the dominant hand and the subsequent change cascade caused in the environment (mathematically that would be: the actions of the Right Hand + the change/resistance induced in the Environment + Past Learning + spatial detection = Left Hand reaction/movement). This has a specific significance to the Bicameral Theory of Mind, as the dominant hand would essentially be the hand of man while the non-dominant would be the hand of god; Jaynes described the hallucinatory god voice as being made up of “stored-up admonitory wisdom,” and this past learning would be a part of my proposed formula, but there are other factors as well– all of which are characterized by the visual aspect of the right hemisphere, like current visuospatial processing and encoded visual memories which rely on a steady mental frame, aspects of which were learned, while other features were inborn. The studies presented previously demonstrate that the right hemisphere is specialized for visuospatial processing, and is similar in many ways to that of both hemispheres of the nonhuman primate, while the left hemisphere is specialized for linguistic processing, syntax, and time, so it would be safe to say that at one time both hemispheres of man were utilized for visuospatial processing and that as language developed it began to build upon the previous functions/structure of the left hemisphere. As this process was happening, likely over a span of hundreds of thousands of years and numerous different species of hominins, the left hemisphere became the place where reality was distilled/subjectified, in the sense that a map, for example, relies on spatial coordinates where the distance between two points is objective (though some maps are more accurate than others, they are still created to represent a specific terrain which should be very similar from case to case) while a novel object, situation, art, etc is always dependent on past experiences and language. Thus we see that the fundamental function of the right hemisphere is to “represent three-dimensional reality of space,” while the role of the left hemisphere is to learn and process language which allows for an awareness that can then be used to subjectively pilot the machine. Analog and metaphor are important parts of Jaynes’ theory, notice that these two functions are made possible by spatial and linguistic mechanisms respectively, once again this demonstrates the tendency of evolution to rebuild upon an already successful model, in this case the frame-content mode of organization. 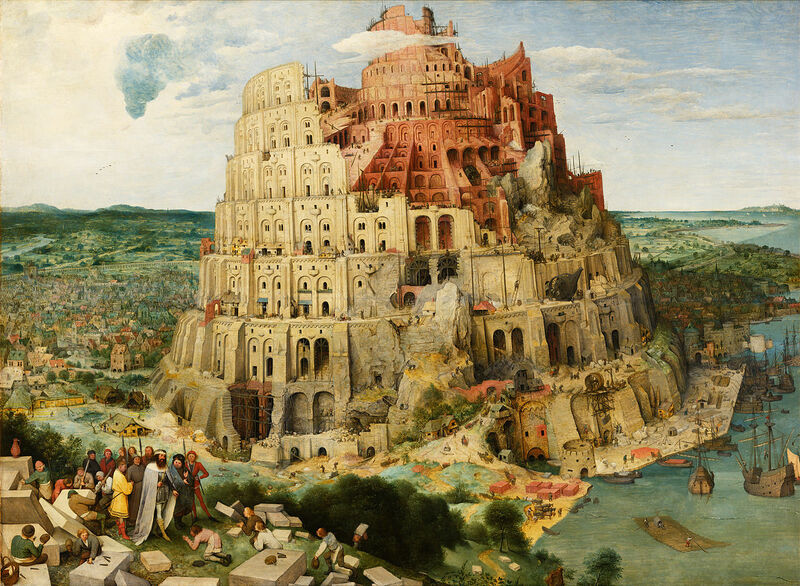 As spatial mechanisms are represented in the right hemisphere, and linguistic processing in the left, it would seem that the right hemisphere would construct a visuospatial analog of the world and the left hemisphere would act upon it with metaphor– just as ancient man struck stone cobbles together to create tools, post-linguistic man manipulates metaphors in mind-space so that he can not only construct possible futures, but examine the recreated past. Before early man acquired metaphor it would appear that he could not move through mind-space in this way, so he lacked introspection, reason, and the ability to examine the past, or consciously project possible futures, but it’s likely that experience was still constantly being taken in by the visuospatial networks of the mind which would calculate the best possible action/movement in a given situation and project this to the left hemisphere in times of need. When viewing the Bicameral Theory of Mind in relation to the One-way Callosal Traffic Theory one quickly notices that in both theories the same side of the brain is responsible for motor signals, these are referred to as the man side of the brain and the major hemisphere respectively, this is essentially the intermediary of the individual and the environment. The god side of the brain and the minor hemisphere are more of an intermediary between the individual and the past, and visuospatial calculation, neither of these aspects require language as they would rely on visuospatial processing to reconstruct visually encoded memories and/or calculate movement. Deacon, T.W. (1997) The Symbolic Species: The Co-evolution of Language and the Brain. New York: W.W. Norton & Company, Inc.
 Tylor, E.B. (1881). Anthropology an Introduction to the Study of Man and Civilization. London: Macmillan and Co.
 Peeters, R., Simone, L., Nelissen, K., Fabbri-Destro, M., Vanduffel, W., Rizzolatti, G., & Orban, G. (2009). The Representation of Tool Use in Humans and Monkeys: Common and Uniquely Human Features. Journal of Neuroscience, 29(37), 11523-11539. Retrieved May 31, 2015. [Note 1] The terms major and minor hemisphere are used by many specialists to denote that one hemisphere doesn’t dominate the other, or that one hand is not more important than the other simply because it is more dexterous. Both hands are specialized to act in conjunction where each hand is essentially a motor and by using them together they work in a series. Metaphor is the often overlooked and undervalued engine which provides much of the power of language, and it allows for the exponential expansion of our otherwise concrete system of symbols. The word metaphor comes from the Greek word metaphora, meaning “a transfer,” particularly in “the sense of one word to a different word, literally “a carrying over.” Like it’s name suggests, a metaphor transfers the usage of one term, or phrase, to describe something else because of a perceived similarity of the two things, or because of a certain relationship which the objects share. 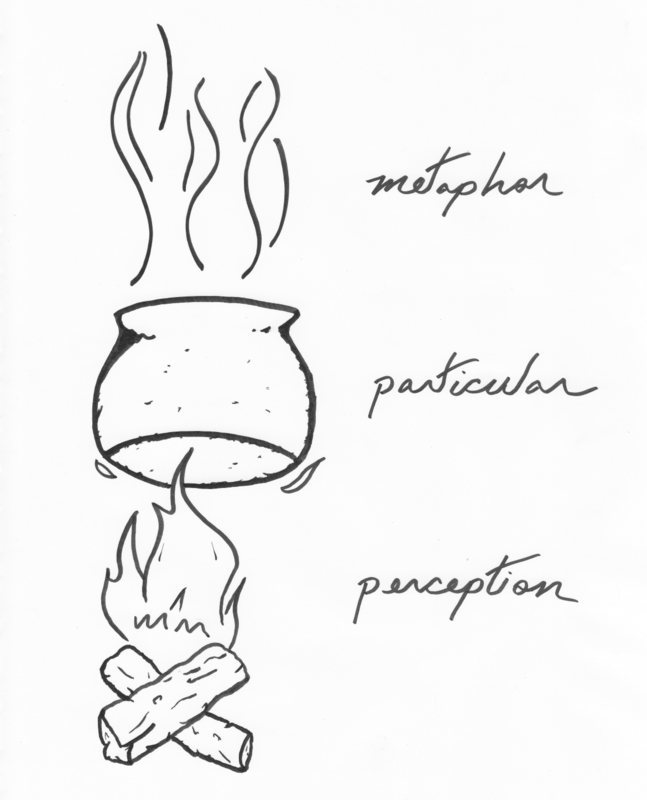 At the most basic level, how exactly does metaphor operate? 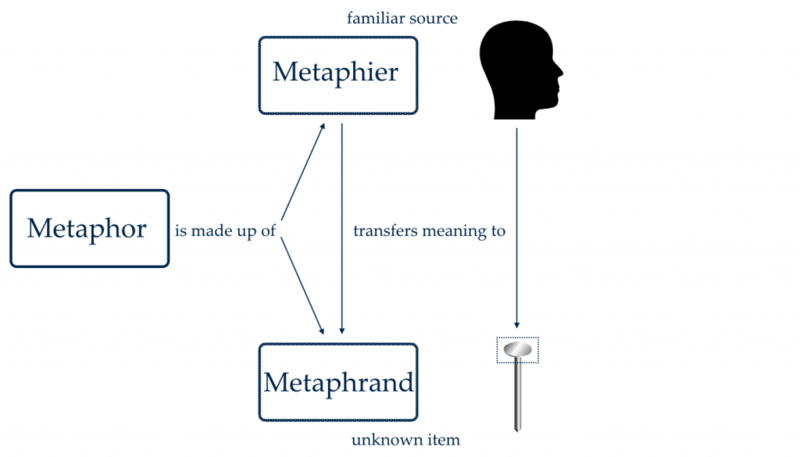 A metaphor is made up of two parts, the metaphier and the metaphrand*– the metaphrand is the unknown/unlabeled object which needs illumination, and the metaphier is the familiar source which provides this. [See Figure 1] In a sense, the metaphier is an iron statue in the mind, while the metaphrand is an unknown ore, in order to try to try to understand what the metaphrand is it must be melted down by the senses into it’s constituent forms which can then be poured into the mold of an existing statue. Anytime you melt down ore there will always be slag, or glass-like byproducts which are discarded, but this is the nature of perception– something is always lost when a thing changes from one form to another. A similar reaction occurs when a person attempts to hand an iron statue to another, the entire statue can’t be handed over, so instead the parts of the statue are described in a way that leads the other person to craft a similar sculpture in their own mind. With art, especially visual art, the artist is able to put down on paper (or whatever medium) what otherwise would be a fleeting idea or image and in doing so others may get a glimpse of the mysterious workings of another’s mind. Analogs allow us to share, and preserve, knowledge in a visual way so that it’s easy to understand, in a sense they could be considered a universal language. Like metaphors, analogs simplify something which would otherwise be too complex to understand or communicate. In a universe which is infinitely large metaphor is a net which allows us to catch otherwise fleeting details and label them so that they can be perceived, spoken about, and recalled. It is this process of labeling that allows us to simplify and then examine the world around us; the forms/particulars which we see are concrete/solid, so they must be distilled before they can fully enter our conscious mind. [See Figure 2] Since we see the world through the lens of language, and metaphor allows for the infinite expansion of our limited set of symbols, it goes to follow that metaphor allows for the expansion of our mind in a similar way. As cognition, and perception, are based on language there would be a natural limit on them if not for the expansive power of metaphor which carries meaning from one subject to another. We believe that we know something about the things themselves when we speak of trees, colors, snow, and flowers; and yet we possess nothing but metaphors for things– metaphors which correspond in no way to the original entities. * These are the two parts of a metaphor with the words coined by Jaynes (the terms were based on multiplication wherein a multiplier operates on a multiplicand), there are other similar terms which were created by other writers but they had a slightly different connotation– the most commonly used terms today seem to be “tenor” and “vehicle” which were created by I. A. Richards. In the narrative, Adam, which is derived from the Hebrew word for soil (adama) as he was created from the earth, was exiled from the garden where he was forced to work the fields in order to eat for the remainder of his life. The name Chava (Eve’s name in the original text) is derived from the Hebrew root chayah meaning life– this is very interesting because she is the first being made from another living creature as all other organisms before her had been formed out of the ground. As you can see, the writers of the Old Testament were very careful with their words, so it’s no coincidence that the Hebrew name of the forbidden fruit is a pun on sin; khet is the Hebrew word for sin, and some Rabbinic traditions regard khitah, or wheat, to be a pun on sin. Thus, the story of the Fall of Man explains not just the acquisition of consciousness, but also of man’s change to an agrarian lifestyle because both events were precipitated by the ingestion of wheat. What did Ancient Hebrew sources say the forbidden fruit was? Rabbi Yehuda/Judah, a 2nd Century wise man who is the most frequently mentioned sage in the Mishnah, the first written compendium of Judaism’s Oral Law, proposed that the fruit was wheat because “a babe does not know to call its mother and father until it tastes the taste of grain.” The first book of the Kabbalah, the Sefer Yetzirah (the Book of Formation) which was said to be written by the patriarch Abraham, says that the forbidden fruit was wheat, this teaching is also found in the Talmud, a collection of the opinions of thousands of rabbis on an assortment of subjects which is second only to the Torah. Many people would question how wheat could be considered a fruit, or a tree; the Talmud says that wheat is a fruit because of the way in which it grows. Sages in the Midrash, an early commentary on Biblical texts, said that wheat once grew as tall as a palm tree, but its height was reduced after mankind had sinned. While viewing the Garden of Eden myth as a metaphor for the change in ancient man’s way of life, this brings us to the question of why ancient man was not “supposed” to eat wheat. I believe that the simplest, and most logical explanation would be that man has evolved over hundreds of thousands of years to eat vegetation in its natural form; wheat, and most other cereal grains (grass seeds), require mechanical processing and baking before consumption so this is something which man didn’t eat until the point when civilization had advanced to a sufficient degree several thousand years ago in the Levant and Iraq. But, on a physiological level, why was wheat so different from the foods which man was adapted to? Before anatomically modern humans (from approximately 30,000 years ago) began adopting agriculture, their diet consisted of meat, fruits, nuts, legumes, roots and tubers, consumption of cereal seeds hadn’t begun to increase until the end of the Pleistocene around 10,000 years ago. (Constantini 1989) Around this time-period, according to Loren Cordain, “hunter-gatherers occasionally consumed cereal grains; however these foods were apparently not major dietary components for most of the year.”(1999)[7, 8] As the climate in much of the world was becoming more hospitable for humans, large game became more and more depleted, and new sources of food were required for humankind’s ever-increasing numbers– it was at this time that gathered plants were becoming more and more important for survival. Despite their nutritional shortcomings cereal grains have several advantages related primarily to ease of storage and planting, but the major change which grains allowed for was a much greater population density. Cereals and dairy foods are not natural human foods, but rather are preferred because they contain exorphins. This chemical reward was the incentive for the adoption of cereal agriculture in the Neolithic. Regular self-administration of these substances facilitated the behavioural changes that led to the subsequent appearance of civilisation. In the bicameral era man would experience hallucinations in novel/stressful situations so that an individual would know what to do, in this sense every man had a god that walked with him and could be experienced face to face; after man began eating wheat this increased various by-products of stress in the body so that the voices would appear intermittently or perhaps almost continuously in some people. Thus you can see how it could be said that ancient man walked with god and spoke with him face to face, because god was always there for him and he provided assistance in times of need; after eating the forbidden fruit man was separated from god because the voices began to be experienced randomly so they would no longer provide helpful commands. The people who were living at the time of the breakdown of the bicameral mind, the first people who had consciousness as we know it, left records of their interactions with god. As god receded from the mind of man like a tide which would never return, the words of the prophets of the Old Testament acted like a bridge which would allow others to cross the chasm which lay under the lost sea. The word of god had replaced the voice of god, but the ebbing tide left behind a hollow space for a new kind of mentality, one which would allow mankind to deal with complex societies which led to much more novelty than they’d ever been exposed to before. Thus, as the hallucinated voice had changed from producing commands distilled from stored-up, admonitory wisdom to what was probably a steady stream of matter-of-fact statements, musings, and reproachful rants, suddenly this voice was a stimuli which one could react to. Not only could the voice provide sudden verbal insight, or “inspiration” (as the now-changing god-side of the mind “breathed into” man), but one could also speak to it in the sense that as the voice (I want to specify here that as the voice occurred more often it would likely be perceived as less and less of an auditory hallucination which was “heard” and more as the god-side of the mind speaking to the man-side in an internal space which was still developing) says something like “look at that drawing, that’s not what the tower looked like” then the man could say “yes, the tower was not round.” So, in effect, we could bounce ideas off of this new structure as if it were another person– it has been said that two heads are better than one, and what amounts to two brains is perhaps the best. Over time, with an adjustment to the diet, the acquisition of new metaphorical language, and a changing social structure, the god-side of the mind became more of an analog space, a mind-space, where narratization occurred. “Dubito, ergo cogito, ergo sum” is an expanded form of Descartes original “Dubito, ergo sum.” It was written by French literary critic, Antoine Léonard Thomas, in an award-winning 1765 essay in praise of Descartes. I would like to thank Rabbi James Cohn and Carole Brooks Platt for reviewing this essay and providing helpful commentary. I would also like to thank musicians Angel Olsen and Will Oldham/Bonnie ‘Prince’ Billy for providing continued inspiration. Constantini, L. (1989). Plant Exploitation at Grotta dell’Uzzo, Sicily: New Evidence for the Transition from Mesolithic to Neolithic Subsistence in Southern Europe, in Harris, D. R. & Hillman, G. C., eds, Foraging and Farming: The Evolution of Plant Exploitation, Unwin Hyman, London. Sinclair, A.J. & O’Dea, K. (1990). Fats in Human Diets Through History: Is the Western Diet out of Step? ; in Wood JD, Fisher AV (eds): Reducing Fat in Meat Animals; pg 1-47. London, Elsevier Applied Science. Bender, B. (1975) Farming in Prehistory: From Hunter-gatherer to Food Producer. John Baker, London. Adams, W.M. (1987) Cereals Before Cities Except After Jacobs, in M. Melko & L.R. Scott eds, The Boundaries of Civilizations in Space and Time, University Press of America, Lanham. Thatcher, J. P. (1987) The Economic Base for Civilization in the New World, in Melko, M. & Scott, L. R., eds, The Boundaries of Civilizations in Space and Time, University Press of America, Lanham. Brantl, V., Teschemacher, H., Henschen, A. & Lottspeich, F. (1979). Novel Opioid Peptides Derived from Casein (beta-casomorphins), Hoppe-Seyler’s Zeitschrift fur Physiologische Chemie, Vol 360; pg 1211-6. Mycroft, F. J., Wei, E. T., Bernardin, J. E. & Kasarda, D. D. (1982). MlF-like Sequences in Milk and Wheat Proteins. New England Journal of Medicine, Vol 301; pg 895. Heubner, F., Liebeman, K., Rubino, R. & Wall, J. (1984). Demonstration of High Opioid-like Activity in Isolated Peptides from Wheat Gluten Hydrolysates. Peptides, Vol 5; pg 1139-47. Svedburg, J., De Haas, J., Leimenstoll, G., Paul, F. & Teschemacher, H. (1985). Demonstration of Betacasomorphin Immunoreactive Materials in in-vitro Digests of Bovine Milk and in Small Intestine Contents After Bovine Milk Ingestion in Adult Humans. Peptides, Vol 6; pg 825-30. Greksch, G., Schweiger C., Matthies, H. (1981). Evidence for Analgesic Activity of Beta-casomorphin in Rats. Neuroscience Letters, Vol 27; pg 325-8. Panksepp, J., Normansell, L., Siviy, S., Rossi, J. & Zolovick, A. (1984). Casomorphins Reduce Separation Distress in Chicks. Peptides, Vol 5; pg 829-83.